A selection of boat pennant flags, maritime flags pennant strings and signal flags from SSNautical.com. All flags and pennants are made in the USA. Decorate your boat for special events or just to show off. 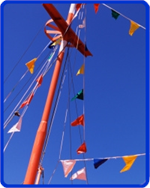 Use pennant flags on your boating adventures and turn people's heads. Attract many followers with some bright and colorful pennants. Our most popular pennant string is available in over 30 color combinations. Decorate your boat for special events or just to show off. American Flag pennants available. Pennant strings for any occasion.